The Heber Valley is filled with wonder. On a recent summer weekend a friend and I took our children, Jennifer and Zoe, age 12 and 9-year old Jack, for a mini-vacation. We stayed at the first-class Zermatt Resort in Midway. It has guest rooms in the four-story hotel as well as condominiums available, which are quite suitable for families. 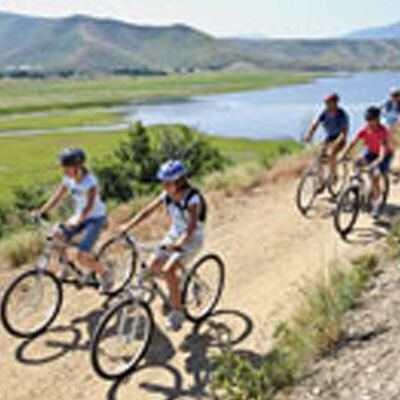 The resort is nestled at the foot of the Wasatch Mountains in beautiful Heber Valley. We hooked up with Drew at Midway Adventure Company in Midway around 9:00 in the morning where we got on some nice mountain bikes and headed through town and out toward Soldier Hollow at Wasatch Mountain State Park. Here we turned off the road, through a very shady grove of large trees and continued on the Deer Creek Parkway trail which curved alongside the hills beside Deer Creek Reservoir. As we continued on a steady climb, we had a wonderful view of the valley and the town of Charleston. We also saw the Heber Valley Railroad coming toward us and it eventually went by on the hill below us. What a pretty picture—the Heber Valley Railroad traveling alongside Deer Creek Reservoir which had several sailboats and motorboats out on the water. We did find that although the hill we were climbing doesn't look very steep from a distance, it's a different story when you have to pedal up a long, gradual climb. Rest breaks were necessary—more often for some of us, as I felt every bit my age! However, the return proved to be every bit as fun as it looked, zipping effortlessly downhill. Riding back to Midway we enjoyed the varied scenery of green pastures with horses lingering about, new houses and old Victorian homes in the small Swiss town. Back at Midway Adventure Company we rested and had a snack before moving on to our next adventure. We piled into Drew's van and headed off in a different direction, once again up into the Wasatch Mountains for a hike. The road up into this part of the mountains was a bumpy dirt road, which the kids compared to a ride at Disneyland. We had been waiting for the snow to melt so we could hike in the mountains. Snow fell through the middle of June this year as Utah's mountains had one of the snowiest years ever. Here it was the beginning of July and, yes, still patches of snow were visible around the area, even next to where we parked the van. We climbed out of the van and continued on foot. We started out in the trees and then by an open meadow filled with wildflowers. What a beautiful sight!!! It was spring here in the Wasatch. We continued into more trees and then came upon a stream. It was a small stream, with clear cold rushing water. You could hear it from a distance as it tumbled over rocks and down the mountainside. After crossing the stream our path narrowed and we passed along some very fragrant wildflowers. It was amazing that such small flowers could give off such an aroma. There were blue, white and yellow flowers everywhere. The kids also became acquainted with stinging nettle. As we continued on around a few curves and gradually upward, we eventually came to the most beautiful overlook of the Heber Valley from quite an elevation. We learned from Drew that there are mines in these mountains which were dug by families who had settled high in the mountains back in the 1880's and were trying to get rich on silver ore. It is very important never to go inside an abandoned mine, as one never knows how safe or unsafe they are, no matter how tempting it may be. I can't imagine living so far away from everyone so long ago with the tough winters they had to survive. They were a lot hardier people than we are, for sure. Once we returned through the sweet-smelling forests, across the creek (this time to play in it a little) and past the flowering meadow, we found Drew back at the van, as he had run on ahead, fixing lunch for us. He had quite the variety for us including sliced fresh fruits for starters. There was delicious bread, sliced roast beef, turkey, a variety of cheeses, fresh lettuce and tomatoes, pickles, olives, onions, two kinds of chips, even peanut butter and jelly as an option for the kids, and cookies for dessert. Lots of cold water was appreciated, too. This was no small lunch. I had one of the best sandwiches I have ever eaten; maybe due to my acquiring an appetite while hiking in the mountains. After lunch we returned to Midway in the comfort of Midway Adventure Company's air conditioned van with our tour guide at the helm. This is only one way to spend a day with Midway Adventure Company, as they offer just about anything you can think of year-round. 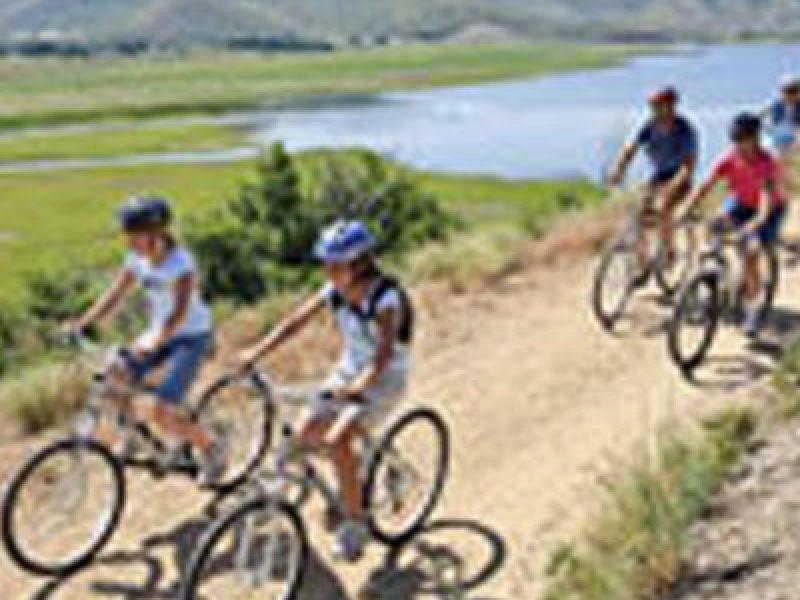 Some of the summer activities include not only biking and hiking, but ATVs, horseback riding, fly fishing, flying, hot air ballooning and river rafting down the Provo River. Now that we were all ready for a treat, we headed over to Spin Café for gelato. They make it fresh daily and offer a variety of tempting selections. They have so many wonderful flavors that you need to plan on many visits! It is served in an authentic Italian biodegradable dish. Lucky for me, this Italian treat has about half the fat and calories of regular premium ice cream. It was a hit with all of us, kids and adults alike. I soon found another opportunity to go to Spin Café for lunch with my husband when we were in town. Since I grew up in North Carolina, I had to try the Carolina Pulled Pork Sandwich. (I am still a Southerner when it comes to cuisine). It is served with the fresh mustard slaw on the delicious potato roll. I recommend it. My husband enjoyed a Jamaican Chicken Wrap which is gently-spiced chicken in a whole wheat wrap with peach salsa, shredded Napa cabbage and toasted sesame seeds. This was served with delicious large homemade onion rings. Of course we had gelato for dessert, although they have many other desserts on the menu. We'll try some of them on future visits. Spin Café is open daily for lunch and dinner and also serves Sunday brunch. They have beer, wine and liquor available.